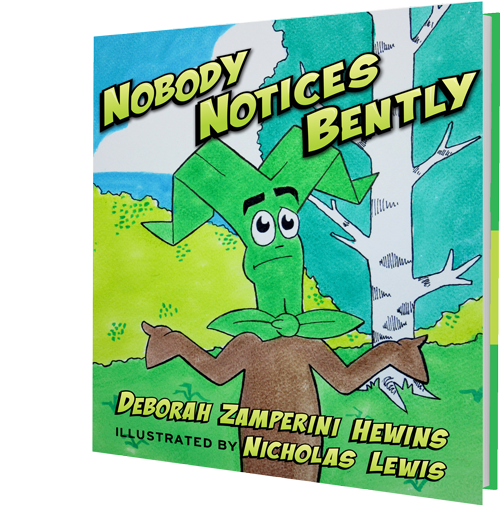 The children’s book Nobody Notices Bently, by Deborah Zamperini Hewins, is a heartwarming tale of personal growth. The main character, Bently, is just a blade of grass – or so he thinks. Bently compares himself unfavorably with other wonders of nature. He sees that Sunflower is admired for her height and imagines that he is the tallest blade of grass ever seen. Bently sees that Daisy is a sparkling white flower and imagines that people think he is bright and beautiful enough to take home. He sees that Violet is an awesome purple color and that people come specially to see her, and he wishes that he were a model or a professional athlete that people would come specially to see. Comparing himself to the greatest qualities of others, Bently feels inferior and neglected, and he believes that life is disappointing and hopeless for a blade of grass. With help from his friends, Timothy and Ladybug, Bently embarks on a journey to find his place in the world. They help him realize that grass is so delightfully green every spring, brightening up our world after a long winter, and that grass helps flowers by keeping the ground cool and moist. Grass provides a soft and comfortable place for cats, dogs, and humans to relax, or even nap. And grass provides nourishment for rabbits, horses, cows and other animals; in addition, worms inhabit lawns before they are food for robins and other birds. Without grass, none of these amazing creatures could exist. A world without grass would be brown, unsightly, and lifeless. Bently learns that, although it may not have the same strengths as other things, grass is wonderful and important. Bently is not ‘just’ a blade of grass; he is a wonderful, glorious, fabulous blade of grass. Nobody Notices Bently is written with an easy vocabulary and is an ideal book for children ages 0 through 6. When younger, your child will understand the easy-to-follow story and colorful illustrations as they follow the words that you read. As your child grows, he or she will be able to read and enjoy the book on their own. By reading Nobody Notices Bently with your child, you will be able to teach him or her many valuable life lessons. Your child will learn about individuality, generosity, gratitude, creativity, friendship, nature, and to be true to oneself. Alongside Bently, your child will learn to appreciate others for who they are and to have confidence in themselves. After all, we are all special in our own way. Bently is a name that means a “bent grass meadow”. Timothy is a grass used for hay, pasture, and silage.